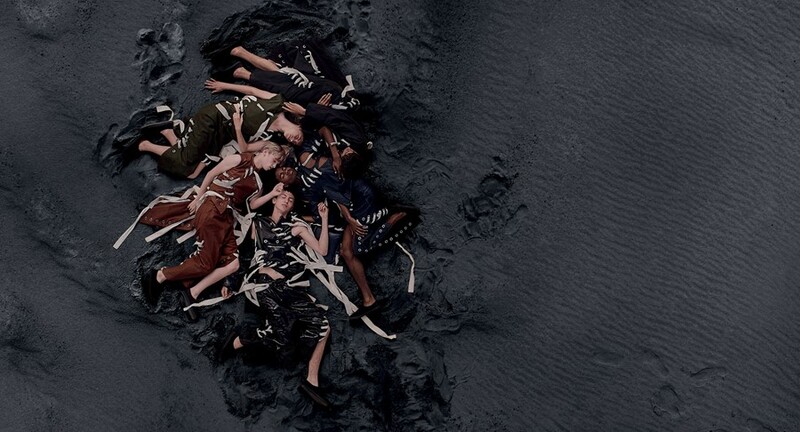 Today, London designer Craig Green unveils his AW16 campaign – a series of images and a slightly dizzying short films featuring groups of models sprawled out on a black sand beach. Several things are unusual about this campaign. Firstly, it’s not shot by a fashion photographer but by a drone and is, as far as we know, the first major fashion campaign to be done so. Secondly, with art direction by Ben Kelway and styling by Dazed’s creative director Robbie Spencer, it features designer’s entire AW16 collection, with all 30 looks split – as they were in the runway show – into six groups of five. To give a little context, this is Green’s third campaign – his first was shot by Nick Knight in the image-maker’s characteristically technologically-advanced style. His second was more of a family affair – his friend and longterm collaborator Amy Gwatkin captured the designer and members of his studio modelling the collection atop a mound of ground up bones somewhere on the Isle of Sheppey. While this campaign sees Green change tack once more, the beauty, romance and gentle futurism of his vision comes through all the same. Here the designer exclusively talks us through this ad, the story behind the drones and why he wanted the images to look more like pages of National Geographic than a fashion campaign. Can you tell us about this collection? Craig Green: The collection was looking at ideas of protection, which is a recurring theme that I always go back to because we're always focussed around workwear, utility, and uniform. So we had things that almost resembled hazmat suits. We cut and tailored them so that you can cinch them, almost so they didn’t let air in. They had that protective, slightly hazmat suit, slightly hospital feeling. Then on the other side of the collection were things like heat washed silk embroidered blankets, and things that looked like they were aged. It was that romantic idea of things you keep forever. The leather sections in the show were almost like crash mats and the bags were like punch bags. So there was a protective energy running through the collection. And there was definitely a romantic feeling too, in terms of colour and texture. Do you think you are a romantic? Craig Green: I think I romanticise things that maybe shouldn’t be romanticised, definitely. I think it’s more just beauty – I think things should always be beautiful in some way. So I guess that sometimes comes out in a romantic way. So how did you translate this collection into a campaign? Craig Green: I always start the collections in a slightly rigid uniform way of grouping. So there were six groups in the show of five boys each, which made thirty. I just thought it would be a new way of doing the campaign to put the boys into groups and shoot them in that way to document them in just six images. It’s quite a strange thing to document every single look from the show as well, and I'm not sure it’s very usual for a campaign. We had to call in all 30 looks from press to do it, so it was a bit of a palaver. We were trying to think of new ways to approach things and came up with the idea of shooting with a drone instead of a photographer so it almost felt like a documentation, rather than era-specific in any way. It’s nothing against photographers – we’ve worked with amazing photographers – it just felt like the right thing to do. And I thought there was something quite great about them looking almost like National Geographic (images) – scientific and cold in some ways, the image is so romantic of all the boys together. We wanted it to have a really dreamy, painterly feel. It’s interesting how you wanted it to look painterly when drones are such an emblem of modernity. Were you drawn to this idea of futurism? Craig Green: I think there’s always a slight futurism in the collections, but they’re always more romantic than futuristic, or hyper-modern or anything like that. It was more about trying to shoot a group of boys and making it look like a painting. They’ve turned out like ordnance survey map shots of a British coast line. There’s something quite epic about them, especially when you see the distance that they're shooting from. There’s no-one near the boys for miles around, which is I guess another romantic idea. The drone was the perfect tool to use. And what’s with the black sand? Craig Green: There was something about the black sand that brought out all of the faded and washed colours of the collection in a much stronger way. I thought there was something really beautiful about it. It was a bit like a sky in some way. What do you like about  creating campaigns? Craig Green: There’s always something about it that allows you to present the collection with something that maybe wasn't captured in the catwalk show. The Nick Knight campaign showed an idea of movement and energy that the catwalk show couldn't express. And this collection was the same. We wanted to really hone in on that rigid way of showing six sets of five boys in the most romantic way possible. It's quite amazing that you're able to project or show an image from a collection that we've shown in a catwalk show, but in a different way.